Below you'll find all necessary information to flash a NodeMCU firmware binary to ESP8266 or ESP8285. Note that this is a reference documentation and not a tutorial with fancy screen shots. Turn to the respective tool documentation for those. Keep in mind that the ESP8266 needs to be put into flash mode before you can flash a new firmware! When switching between NodeMCU versions, see the notes about Upgrading Firmware. A Python-based, open source, platform independent, utility to communicate with the ROM bootloader in Espressif ESP8266. Run the following command to flash an aggregated binary as is produced for example by the cloud build service or the Docker image. flash-mode is qio for most ESP8266 ESP-01/07 (512 kByte modules) and dio for most ESP32 and ESP8266 ESP-12 (>=4 MByte modules). ESP8285 requires dout. See below if you don't know or are uncertain about the capacity of the flash chip on your device. It might help to double check as e.g. some ESP-01 modules come with 512kB while others are equipped with 1MB. esptool.py is under heavy development. It's advised you run the latest version (check with esptool.py version). Since this documentation may not have been able to keep up refer to the esptool flash modes documentation for current options and parameters. The firmware image file contains default settings dio for flash mode and 40m for flash frequency. Self-contained NodeMCU flasher with GUI based on esptool.py and wxPython. Disclaimer: the availability of NodeMCU PyFlasher was announced on the NodeMCU Facebook page but it is not an official offering of the current NodeMCU firmware team. To enable ESP8266 firmware flashing GPIO0 pin must be pulled low before the device is reset. Conversely, for a normal boot, GPIO0 must be pulled high or floating. If you have a NodeMCU dev kit then you don't need to do anything, as the USB connection can pull GPIO0 low by asserting DTR and reset your board by asserting RTS. If you have an ESP-01 or other device without built-in USB, you will need to enable flashing yourself by pulling GPIO0 low or pressing a "flash" switch, while powering up or resetting the module. If you build your firmware with the cloud builder or the Docker image, or any other method that produces a combined binary, then you can flash that file directly to address 0x00000. Lua scripts written for one NodeMCU version (like 0.9.x) may not work error-free on a more recent firmware. For example, Espressif changed the socket:send operation to be asynchronous i.e. non-blocking. See API documentation for details. The NodeMCU flash file system may need to be reformatted, particularly if its address has changed because the new firmware is different in size from the old firmware. If it is not automatically formatted then it should be valid and have the same contents as before the flash operation. You can still run file.format() manually to re-format your flash file system. You will know if you need to do this if your flash files exist but seem empty, or if data cannot be written to new files. However, this should be an exceptional case. Formatting a file system on a large flash device (e.g. the 16MB parts) can take some time. So, on the first boot, you shouldn't get worried if nothing appears to happen for a minute. There's a message printed to console to make you aware of this. The Espressif SDK Init Data may change between each NodeMCU firmware version, and may need to be erased or reflashed. See SDK Init Data for details. Fully erasing the module before upgrading firmware will avoid this issue. 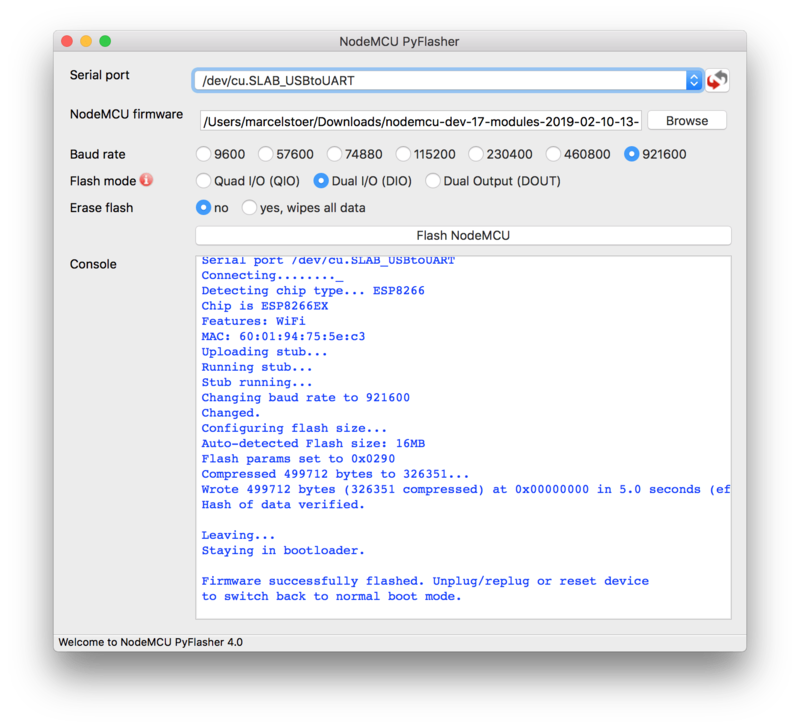 Normally, NodeMCU will take care of writing the SDK init data when needed. Most users can ignore this section. NodeMCU versions are compiled against specific versions of the Espressif SDK. The SDK reserves space in flash that is used to store calibration and other data. This data changes between SDK versions, and if it is invalid or not present, the firmware may not boot correctly. Symptoms include messages like rf_cal !=0x05,is 0xFF, or endless reboot loops and/or fast blinking module LEDs. Also verify that you are using an up-to-date NodeMCU release, as some early releases of NodeMCU 1.5.4.1 did not write the SDK init data to a freshly erased chip. Espressif refers to this area as "System Param" and it resides in the last four 4 kB sectors of flash. Since SDK 1.5.4.1 a fifth sector is reserved for RF calibration (and its placement is controlled by NodeMCU) as described by this patch notice. At minimum, Espressif states that the 4th sector from the end needs to be flashed with "init data", and the 2nd sector from the end should be blank. The default init data is provided as part of the SDK in the file esp_init_data_default.bin. NodeMCU will automatically flash this file to the right place on first boot if the sector appears to be empty. If you need to customize init data then first download the Espressif SDK 2.2.0 and extract esp_init_data_default.bin. Then flash that file just like you'd flash the firmware. The correct address for the init data depends on the capacity of the flash chip. 0x7c000 for 512 kB, modules like most ESP-01, -03, -07 etc. 0xfc000 for 1 MB, modules like ESP8285, PSF-A85, some ESP-01, -03 etc. See "4.1 Non-FOTA Flash Map" and "6.3 RF Initialization Configuration" of the ESP8266 Getting Started Guide for details on init data addresses and customization. The chip ID can then be looked up in https://code.coreboot.org/p/flashrom/source/tree/HEAD/trunk/flashchips.h. This leads to a manufacturer name and a chip model name/number e.g. AMIC_A25LQ032. That information can then be fed into your favorite search engine to find chip descriptions and data sheets. By convention the last two or three digits in the module name denote the capacity in megabits. So, A25LQ032 in the example above is a 32Mb(=4MB) module.